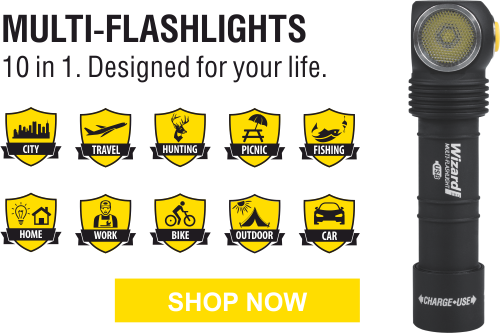 HomeProduct NewsArmytek makes a splash with new flashlights! Extreme brightness 950 lumens for the flashlights of such a small size. They won’t create additional weight or cause any discomfort especially during long-term carrying. TIR-optics guarantees wide light for large area illumination without an effect of “tunnel vision”. It means you get soft light border, which doesn’t cause headaches. Easy operation and indication of low battery voltage. You’ll be warned about battery charge in advance. It’ll help you to prevent unpleasant situations. The highest standards of durability and reliability: excellent resistance to fallings from 10 meters, harsh impacts, vibrations, scratches, dust- and water penetration. All these significantly increase the range of flashlight usage. Strong and durable headband made of soft and flexible materials for comfortable fixation of the flashlight on the head. It won’t be tight, rub or fall down when you’re walking, running or repairing something. Hands-free lighting. Moreover, you can aim the light where needed. You are always ready, do everything faster, more effectively and with greater safety. Powered by the most popular power source – one AA battery. May be powered by 14500 Li-Ion for higher brigtness and longer runtimes. The smallest headlamps on one CR123A battery. May be powered by rechargeable R123 batteries. These attractive features are simply the evidence of our commitment to keeping our flashlights up-to-date and competitive. Don’t miss your chance to get to know our top headlamps equipped with the latest technologies that will keep you a step ahead! Order now and be the first to try the best!